2 How to get the jio sim with unlimited preview offer free on any device? Friends, we are very happy to inform you that, reliance officially announced that their jio sim with unlimited preview offer will be available for all 4g handsets from today. There is no need of any Samsung or Lyf handsets now. You just need a 4g device to get jio sim with unlimited preview offer. A 4G handset, That’s enough now for getting a jio sim with unlimited preview offer. And there is no need of coupon generating or any other tasks.Just follow below simple procedure and get your jio sim with unlimited preview offer for free. Important Note: Some of our visitors reporting they are not getting jio sim from reliance digital store. The thing is that, this jio offer for all devices just announced and takes time to effect. However, there are many reliance outlets giving jio sim for all devices now. so i suggest you to call nearest reliance digital outlet before going there. this will save your time. otherwise just wait for 1 or 2 days. for more details read below FAQ section. How to get the jio sim with unlimited preview offer free on any device? UPDATE – YOU NEED TO GENERATE A COUPON CODE [BARCODE ] BEFORE GOING TO JIO STORE TO GET A JIO SIM. YOU CAN GENERATE BAR CODE FROM MY JIO 3.2.05 VERSION EASILY. You can refer below given trick to generate coupon code. Yeah. From today For getting a jio sim, you don’t need Lyf, Samsung or any other specific device, It’s open for all devices. ** Just go to your nearest reliance digital store with following documents and get your free jio sim with unlimited preview offer. 3) One passport size photograph. That’s it. You will get jio sim with unlimited preview offer from any reliance digital store by following above procedure. For further activation process of jio sim and preview offer, just follow the jio store or customer care instructions. Many of you bought a new reliance jio sim and not able to activate it. WE are receiving lots of messages saying ‘ my jio sim not activated till now ! how to activate my reliance jio sim fast? how much time it takes to activate my reliance jio sim? ‘ etc. Due to heavy rush, reliance services are delay in processing sim activation. But don’t worry friends here techintor.com providing you a method to activate your jio sim fast. 1. Go to reliance digital store with your generated bar code along with your proofs. here you need to take your Adhaar card as proof. In this way you can easily activate your new jio sim. This is adhaar card based activation, so an adhaar card is must for this method of activating jio sim. 1. Now You can port your old mobile number to reliance jio using jio mobile number portability option. 3. Now you will get retun message with your unique porting code. 4. Now download my jio app and generate ‘ coupon code’. 6. You will get jio sim in your old number. This way you can get reliance jio sim on your existing number with jio welcome offer which valid upto 31st december 2016. 1) Do i need to complete any tasks before going to reliance digital store to get a jio sim? or I need to generate the coupon code before going to reliance digital store ? Ans: You need to generate a coupon code fr getting jio sim now.if your phone is eligible for jio sim [ check above partners screenshot, link] then download my jio latest app from here and generate the coupon code. Ans: No there is such tasks. Just visit your nearest reliance digital store and submit above-given documents. that’s all. your jio sim with unlimited preview offer ready for free. 2) I don’t have a Lyf, or Samsung device? still, i get jio sim with unlimited preview offer. ? Ans: Yes, from today you don’t need a specific device to get jio sim and preview offer. It’s open for all 4g handsets. 3) I am an IPhone user, can i get jio sim with unlimited preview offer of 3 months on my iPhone ? Ans: Jio sim with preview offer now available for iPhone also. if you are an iphone owner then go to your nearest jio store and get the jio sim. iPhone users dont need to generate a coupon code for getting jio sim . just go to reliance digital store directly. 4) I went to a reliance digital store for jio sim and said about this offer ! but they are not giving sim except samsung or other spcicific devices. what will i do? Ans: This jio offer is just launched now. It takes time to get this news to all relaince digital stores. So wait for one or two days. You will surely get jio sim on any your 4g device. Have patience. Better to contact your reliance digital store by phone call and ask the same before going to store. 5) what is the unlimited preview offer from jio? Ans: You don’t know that !!! This is one of a great deal from reliance jio. Ans: we are published a separate article for answering this question. Check: Tricks to increase reliance jio speed. we are added more than 3 tricks to increase reliance jio speed in that article. Now you don’t need to follow below tricks to get jio sim. its officially available for all 4g handsets. So ignore below described things. But you can read it for understanding more about jio and jio offers. Hi friends, Today we are sharing a simple trick that gives you free reliance jio sim with preview offer without any LYF handsets. By Following this trick you will get reliance jio sim with unlimited calling and unlimited 4g on any android device. The Reliance Jio Preview Offer is Unlimited Free 4G internet + Unlimited free calling with a validity of 3months. This one attracted all people and everyone started buying LYF handsets for getting reliance jio sim with preview offer. Jio and Lyf handsets gonna trending on the internet and its get huge success. Everyone used LYF handsets as wifi hotspot 🙂 . yes, Unlimited 4g for 3 months. There are some cheapest smartphones [starting from 3k around] from Lyf is available so everyone go for it. Many people bought LYF handsets. And the reliance jio 4g speed was awesome; this too gonna trending on the internet.everyone started sharing their jio 4g speed on social networks. This attracts more and more people to jio sim. Recently Jio enlarged the offer to some sSamsungdevices and iPhone devices. This is a very happy news for all android users. and this is a best chance to get reliance jio sim free with the preview offer : unlimited 4g internet fro 3 months and unlimited calling for 3 months. RELIANCE JIO NEWS UPDATE ON OFFICIAL LAUNCH: JIO WILL OFFICIALLY LAUNCH ON AUGUST 15There is some news spreading that, reliance jio will officially launch on august 15. And it will be officially available for all devices. Also, there are some rumours that the unlimited free 4g internet + preview offer will available for those who port their 1-year-old mobile number to jio network. It means, if you have one 1-year-old sim then you can get unlimited 4g + other jio unlimited preview offers in it by porting to jio network. If jio starts MNP service with unlimited preview offers, it will definitely affect other Indain network providers. 1. Download Jio app from here – Click here : [this is an old version of jio app.] note: don’t download from playstore. 4. Now turn on your mobile data /wifi connection. 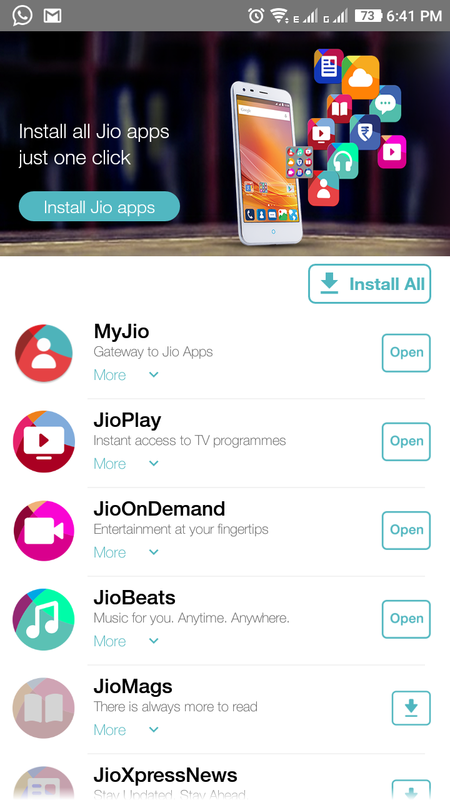 Then download all jio apps [10 apps] from jio app which is installed on step 2. 5. Then again turn off your mobile data/ wifi connection. also clear your recent apps. Make sure that jio app is not in the multi-tasking tray. 6. Open My JIO app. And now tap on get jio sim button. 9. Again tap on ‘get jio sim’. Now you are able to get the jio sim coupon. Note: This is the latest trick to generate the coupon for getting jio sim. You can refer below old trick for more clarification and other details. 2. Now open myjio app and tap on install all button. This will start installing all other 10 apps which are related to jio. wait until it installs all jio apps successfully. 8. Now enable your mobile data and go forward with it. Fill details and complete. 9. At last you get an offer code/[ barcode]. Go to your nearest jio office with this barcode [printed] and proofs. That’s it, You will get your reliance jio sim there. Activate the jio sim and start enjoying the unlimited internet and calling jio preview offer. Note- At the jio office there is a chance of asking your LYF handsets/Samsung handsets. Just tell something wisely. Don’t tell about this trick. It’s your skill to convince them. PS – If your friends have Samsung Galaxy S7, S7 Edge, S6, S6 Edge, Note Edge, Note 5 (+ Duos), Note 4, galaxy A7 2015 , OR Galaxy A5 2015 & 2016 device then go with that device and show them that you have a Samsung jio preview offer available device. I know all of you faced this 2gb data limit problem. You got a jio simon your non preview offer device and successfully activated the sim. but after activation, you see that the preview offer is limited. the 4g data is limited to just 2gb. that is not what you need. In this section, we will give you the solution for ‘jio new sim 2gb 4g data limit in preview offer’. 3. open my jio app and click on install all jio apps. 8. you are done. now your 2gb limited jio offer is converted to unlimited preview offer. NOTE – IF POPUP NOT APPEARED THEN CLEAR DATA OF YOUR JIO APP AND REPEAT THE STEPS FROM 5-8. 3. Then login to you account jio app. 4. After login, they ask u to download the above 4 apps. [ which u already downloaded now.] and below it you can see a submit button. tap on the submit button. 5. You are done. You will get unlimited offers now. you can enjoy unlimited 4g internet data, voice calling [VoLTE] and Sms in your new jio sim now. By this way you can grab free reliance jio sim with unlimited preview offer. get your reliance jio sim with preview offer [unlimited calling and 4g internet] on any android device now. So what should i do. Print out of bar code pics or not?? And also you got the sim or not..? Today I went to jio store. I found that there is a new form available in which you have to write your device manufacturer, model, IMEI and more such details. Also offer is only applicable to selected Samsung devices. This is due to some bug in My Jio App. Also I have read some articles that says that if you able to get jio sim then most probably it will not get activated because bar code (offer code) is not generated from an eligible Samsung device. It's all about your luck and skill to convince officers in jio store. There are many people said that they got the jio sim successfully with this trick.. also many of them saud some issues like above.. I tried the above method in Redmi Note 3 but it is didn't show Get Jio Sim menu. So it is not working, at least for me. Bro this trick work for Redmi note 3.. I m using rn3 and also get 90 days offer. i genarate the coupon code on Samsung galaxy j7 and got a jio sim from reliance digital store but when the sim activation then reliance digital store tell me that the coupon code is already redeem.how its possible?please help.and how to know the coupon code redeem or not.my coupon code is validate on 7th August.please please help..
Hi, I own Samsung On5 and downloaded all the app but not able to generate the coupon, can you please help me out with this? Done all the steps but it is not showing that "Get Jio Sim"
"Log into my jio to activate your jio preview offer" this is the fifth step mentioned. What to do? Hey it worked.but,in screen shot I don't have any bar code I got only coupon code in which first 4 digits is not clear,b it I saw it generated bar code in app..coupon code will alone is sufficient ? HOW WILL THEY VERIFY?whether the phone is generated in that mobile or not? i have generated the coupen code on my mi4i. but when I went to the jio office they said we r giving jio sim on Samsung mobiles only, by this trick. so is it fake to get sim on any android device by coupen? hey dear i wanna want to know that, if my Airtel sim block what i do for unblock quickly…. sir…. , i am using samsung on 7. but i am not able to generate the barcode cupon , if possible pzl details me, "GET JIO SIM" option is not coming there. Hello..,i got the sim on galaxy s7 edge i activated it and i tried to activate the unlimited offer but i got the 2gb internet but no unlimited ,when i click avail offer it says offer us activated but the unlimited offer is not ready can u pls help me,i tried both the above trick u gave but not working, and one more thing can we activate this offer on another phone rather than which i got the barcode?? Can u e-mail me plsss its been 10 days since i got the sim but no unlimited its like a waste.email @ [email protected]. The option to activate the preview offer is not showing up even after following the steps that have been mentioned by you. PLEASE HELP. jio is working in 3g samsung phones or not. what is proof that this offer available for all device. because not any website says including official website???? i have lenovo vibe k4 note I get the barcode .when i get jio sim.b ut not active this sim . please replay soon as soon possible how to activate…. How to activate JIO sim after getting it? You need to call on 1977 to activate your JIO SIM. I am using Le Eco Le 1S, i'm not getting Get Jio Sim Option. Bro,I Have Xolo Era 4G As You Show In The Eligible Smartphones List That Era 4g Is There And I Already Got Coupan Code(Bar Code)!! !Can I Get 4g Jio Sim Or Not If i go to reliance digital store???? I have Redmi 3S Prime I am not getting Get Jio Sim Option. How can I get Coupon code. Sir i have htc one x9 and i got the get gio sim option but after clicking it a popup is shown 'our system couldn't process your transaction please try later'. I have tried many times but didn't get barcode. Please tell what to do? Bro just uninstall all your jio apps and download only my jio and just click "skip sign in "
Not showing get jio sim ? i had activated jio sim yesterday and the related apps were already installed in the xaoimi redmi note 3 . now ihave exhausetd 2gb data but still not able to activate 4gb daily dta offer i.e. welcome offer. i tired three four times by unstalling / installing apps .. but to no use. sir…. , i am using LYF LS-4004. but i am not able to generate the barcode cupon , if possible pzl details me, "GET JIO SIM" option is not coming there. use my jio 3.2.05 version to generate barcode. article updated with 3.2.05 version download link. help me I m using phicomm c630 but can't generate bar code I followed all steps but can't How To Generate bar code????? brother, i didn't get what u mean actually. if the barcode shows redeemed then it means you are already used that barcode or may you have generated barcode with old trick [by downloading 10 apps] and it got expired. my jio 3.2.05 trick worked. Generated 2 coupons from different phones successfully. I have ASUS Zen fone max ,I already downloaded my jio app but it doesn't show generate bar code. What will I do…..